As a young child, Barack Obama lived in the Indonesian capital of Jakarta for five years with his American mother. First, I want to make it clear that I don't think it should matter to us what kind of school Obama attended as a child. As to his present faith, the controversy concerning his Chicago pastor highlights his longstanding membership in a Christian church. In any case, I personally do not think religious affiliation tells us anything meaningful about a candidate's fitness for office. Nevertheless, simply because a recurring rumor such as this can and should to be addressed, I tracked down the truth concerning Obama's Indonesian sojourn. Obama attended two schools in Indonesia. One school was called SD Franciscus Asisisi. I have it on good word that not many madrasah are named after Saint Francis. So I crossed that school off my list. What about the second school Obama attended in Indonesia? The name sounded fairly benign: SDN Menteng 01. But if the young Obama attended a madrasa, this was it. So I hailed a taxi and paid a visit to SDN Menteng. My driver got confused because a road leading to the school was blocked by security to protect the American ambassador's residence. SDN Menteng is a block away from the US ambassador's house. Nearby are two old churches. It's not your typical neighborhood in this, the world's largest predominantly Muslim country. The SDN Menteng 01 facility is built around a courtyard which serves as a basketball court. Obama's love for this American sport almost certainly began here. 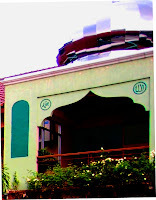 Above the court, to one corner, is small mosque structure (first photo). Yep, the school has a small mosque attached to it. Had I found the fabled madrasah? But if this was a training center for jihad, something was badly amiss. Because as I stood in the courtyard staring up at the small dome, students flew by me shooting hoops. 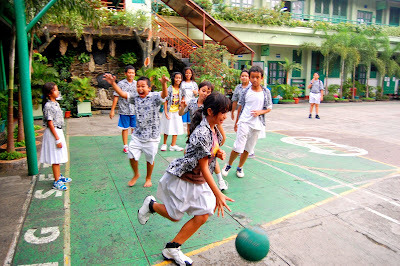 In fact, most of the students circulating around the basketball court were girls. They wore no head scarves. In fact, one girl wore surfer shorts. I watched as she aggressively kept two boys in check. I listened hard, but I did not hear any chorus of small voices reciting the Koran. Instead, from inside the entrance foyer came shouts of kids practicing their Kung-fu kicks and punches. Ka! Ka! 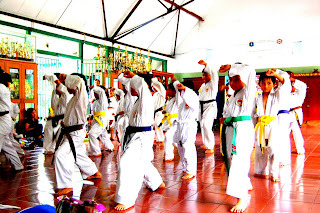 I saw yellow, orange, and green belts tied around small white coats. The principal would later tell me that the children have a choice of thirteen after-school activities. Undeterred, I told the school principal about my urgent need to verify whether his school was, in fact, a madrasah. So the principal summoned the custodian. And the custodian walked me upstairs to a locked green door adjacent to some classrooms. He turned the key and the door opened. That's when I saw Jesus Christ. 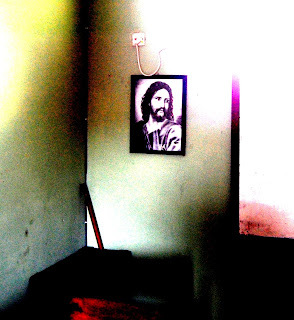 That is, I saw his likeness framed on the wall. In one corner of the room Bibles were stacked on a table behind a crucifix. The sign above the door read "Christians Lesson Room." The principal explained to me that the Indonesian concept of religious freedom means public schools like SDN Menteng 01 provide religious education for students -- whatever their faith. Whereas the American approach has been to exclude religion from public schools, the Indonesian way is to provide religious lessons to students -- according to the faith of the student's family -- through the public school. In my opinion, it makes little difference what kind of school a forty-six year old man attended when he was a child of six. But we can see that any allegations that Obama attended some kind of extremist Islamic institute as a child are entirely without substance. * Connotation associated with recent American usage of the term "madrasah" differ markedly from the actual meaning of the Arabic word madrasah which simply means "school." The New York Times corrected itself, writing that its story about Obama's Madrasah "referred imprecisely to madrasah. While some teach a radical version of Islam, most historically have not." More about madrasah at Wikipedia. Background: CNN was the first to debunk this story. Since this rumor was started by Insight Magazine and shortly thereafter broadcast by Fox News, over 50 news organizations have paid a visit to SDN Menteng 01, the principle told me. Jotman was not the last. Just as I was leaving, a foreign camera crew was moving in to do yet another story. Fox News has apparently succeeded in removing all trace of its original report that Obama attended a madrasah. The wildly inaccurate Fox News video clips have been removed from YouTube on "copyright infringement grounds." The real story here is the fact that Fox News gives substance to outrageous rumors, and then -- after the distortion had been exposed -- attempts to cover up its tracks. As I have blogged, not only does Fox News make American people stupid, it forments anti-American sentiment overseas. Photos: All photos by Jotman. Coming soon: Excepts from my talk with the principal of SDN Menteng 01.